Even those within the same breed, within the same litter, can vary in how quickly they learn and pick up house manners. Puppies are definitely born with individual personalities that can be made up of a combination of genetics, hormones, womb conditions – but they’re also influenced by their environment and how we teach them. Matilda at four months old, with button ears and a taste for mischief. 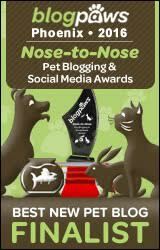 During the first few months, you won’t be choreographing doggy dance routines or elaborate behavior chains. If you’re the average pet owner, you have standard expectations for your puppy: they should not have accidents in the house, and they should only chew their toys, not furniture, shoes, or other forbidden objects. To achieve these goals in record time, you’ll need to master just three things: supervision, redirection and management. You’ll need to supervise your puppy as much as your schedule allows. 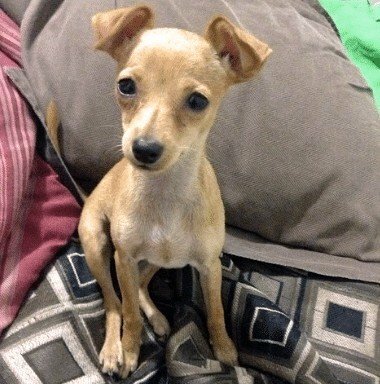 If your puppy is starting to have an accident or chew on something other than a toy, you need to be present to redirect the puppy to an appropriate potty spot or toy. 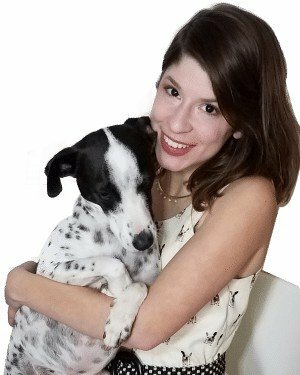 Management is what you’ll use to prevent mishaps whenever you take your eyes off your puppy, whether you’re home or not. Many people use a crate to manage their puppy when they’re asleep or not home, but you can only crate your puppy for 2-4 hours at a time. Pet gates are important management tools because they keep forbidden objects out of reach. They make it harder for your puppy to sneak off and have an accident. You should use pet gates strategically throughout your home to create safe spaces for your dog. Many puppy owners use a kitchen or bathroom to contain their mouthy, accident-prone puppy. These areas typically don’t have carpeting, and any dangerous objects like cleaning solutions or food can be put away in cabinets with a child-safety lock. Pet gates also make a great alternative to crates. Many puppies will take weeks, even months to rest comfortably in a crate without crying or having an accident. 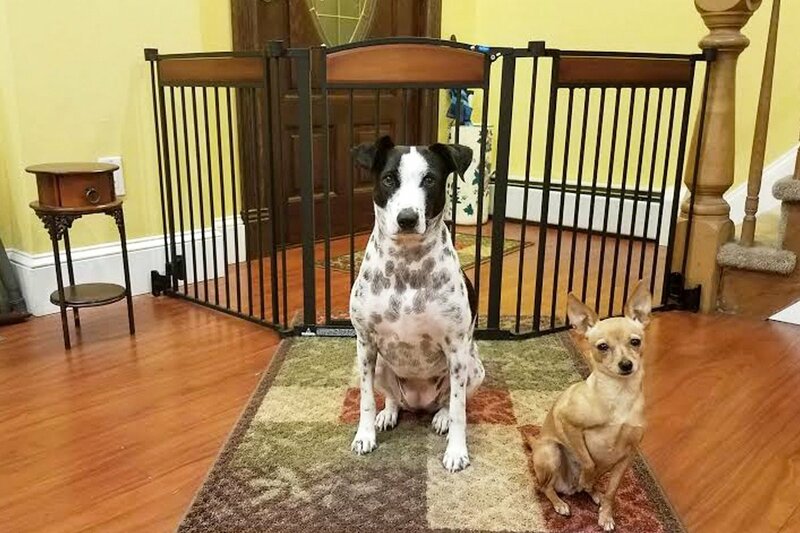 Using a pet gate to create a safe space is a wonderful alternative to a crate. Your safe area can contain a puppy pad, open crate or bed, water and a few toys. 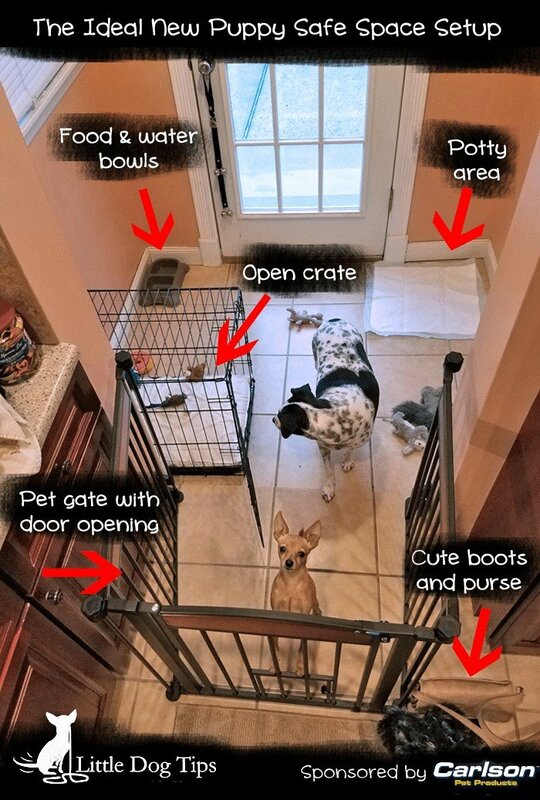 You should also set up a gate near your front door to keep your puppy from escaping. As careful as you might be when arriving and departing, your family members might not be as agile. It’s also tough to keep a puppy from dashing when you’re signing for a delivery or getting a pizza delivered. Keeping your dog away from forbidden objects and empty rooms are the best way to set them up for success during the bitey puppy stage. If your puppy spends most of their time chewing on appropriate toys during the first few, very impressionable months of their life, they’ll have a greater chance of seeing toys as toys – and a lesser chance of seeing forbidden objects like socks, furniture legs, shoes, and even plush animals that do not carry their own scent – as chew toys. Additionally, a dog that has formed a habit of relieving themselves on a certain surface – grass or a puppy pad – the sensation of standing on a carpet will be less likely to make them want to relieve themselves. In those few moments when your well-managed puppy does get a hold of a forbidden object, you can practice skills like “drop it,” by calmly offering a tasty treat or fun toy. Chasing your dog and prying items out of your dog’s mouth isn’t too difficult when they’re a puppy, but it will teach them to run and hide, making them sneakier about destructive chewing. Avoid prying items out of your dog’s mouth unless it’s an emergency. Do your best to get them to drop items willingly. How Long Does Your Puppy Need Pet Gates? You may dream of one day giving your puppy free run of the house, but most of us allow this too soon – setting our puppies up for failure. Only give your puppy access to one new room at a time, for limited, supervised visits even if they haven’t chewed anything or had an accident in a while. New environments provoke a puppy to spread their scent by peeing or pooping, and unfamiliar objects can be particularly enticing. Progress will, most likely, be slower than you’d like. Some dogs can never be reliable enough to be unsupervised throughout the home. Be sure to invest in quality pet gates that won’t inconvenience you and your family. I recommend pet gates from Carlson Pet Products. They offer a variety of pet gates with built-in doors so you don’t have to find yourself constantly stepping over and dismounting gates just to walk through your home. 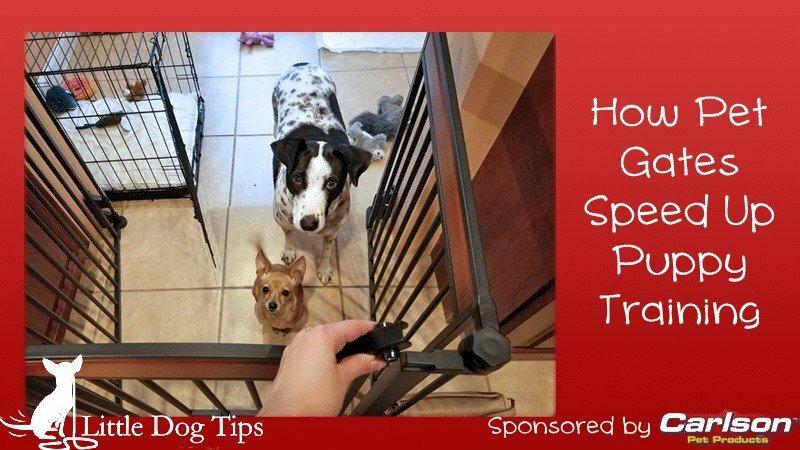 I didn’t think I could ever find a way to keep Matilda and Cow from door dashing until I discovered the Design Paws Flexi Gate – this model fits wide, angled or unusually shaped entryways. Matilda and Cow are learning to respect the door entryway now that there’s a visible barrier. This doesn’t mean I’ve stopped working on training them to stay indoors or stop trying to run across the street. In fact, the door makes this even easier. They’ve already learned to respect the boundary and wait for me to allow them across, instead of dashing through whenever it’s open. Even with training, they could potentially dash out in a stressful situation. I’m also able to keep them contained when they’re overly enthusiastic to greet visitors. I don’t have to worry about them trampling Grandma (they loooove grandma!) and they get a chance to calm down before the gate is opened. Pet gates are handy management tools even after the training phase. It’s not unusual to have them for your dog’s entire life. So, you might as well get one that’s stylish and won’t get in the way. Great article Lindsay. I like how you gave details on the crating, when you specifically pointed out that you can only do it for a few hours. I think it’s important for people to know that you cannot crate for a crazy long time. Thanks again for great post! Thanks Vince! I agree, I know it’s tough for many people to limit crate time, but all that craziness in the beginning is so worth it to have a well-rounded adult dog. Yep I couldn’t do without dog gates either. As soon as anybody comes near the door Millie (my dog) is right in there. 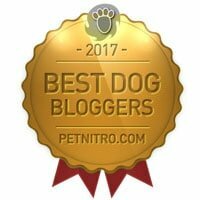 Kieran recently posted…What is the Best Pooper Scooper for Dog Poop?